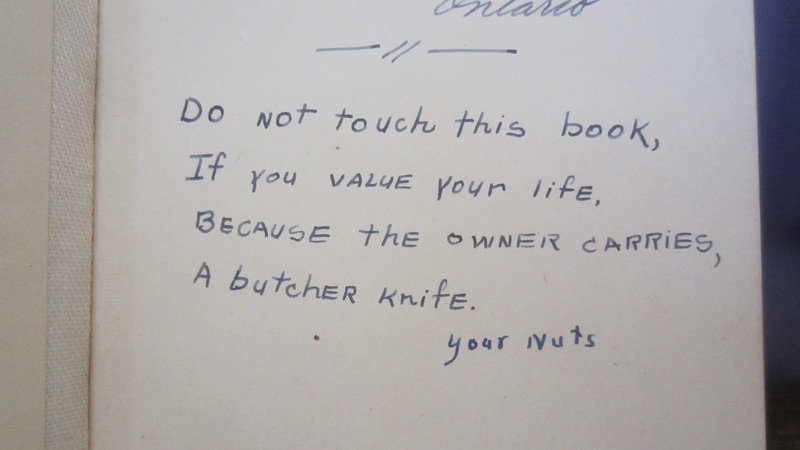 Sometimes it’s not an item that’s left inside a book, but an inscription. In old books, these can be especially fun if you want to track what year the book was given to the recipient or to find out what special occasion or personal reason the book was selected. But what was the writer of the above inscription thinking with this one?! Did they have an annoying little sister? A prison sentence? Did they hide X-rated things between the pages they didn’t want their mom finding? Regardless, they must really not have wanted to share it, so I’m keeping my eye out now that it’s in our possession. We’ve been sufficiently warned, that’s for sure.